The underworld is the lowest region of the universe, the home of underworld deities such as Nergal and Ereskigal, and the final resting place of deceased humans. 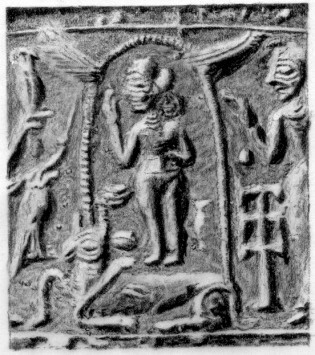 In KAR 307, the underworld is identified as the lowest of three earths, and 600 Anunnaki are shut inside. No text other than KAR 307 can confirm that the underworld was located below the Apsu, since only KAR 307 considers the relative locations of the the underworld, Apsu, and earth’s surface together. …no one is ever said to ascend to the underworld, and there is no evidence for any cosmic feature below the underworld. This underworld, too, is a concept transferred over to Israel uncritically – note the continent-sized cavern marked “Sheol”, “Abaddon” and “Hades” on the diagram. Sheol is certainly a feature of creation in Hebrew thought (and so part of The Hump’s brief). But does it take such a form? Now, in Mesopotamia both the Apsu and Ereshkigal have quite full mythologies, probably reflecting the polytheistic nature of their religion: once gods are assigned to a responsibility, they need palaces and infrastructure, jobs to do and subjects to rule. Yet both ideas must have first arisen from phenomenological realities: one digs down and finds the aquafer to supply ones needs for water; one buries ones dead under the ground (or in it – “ground” is as flexible a term as “sky” regarding whether it means the medium or the boundary). As always, though, we moderns must be cautious about how physically even the Babylonians understood these realms: graves were usually above the water table, yet the underworld was below it. And though one believed the dead had some shadowy existence in Nergal’s realm, everyone knew that their physical remains could be dug up. So if some kind of spiritual afterlife was believed, why assume that they must have believed the realm itself was physical? Nevertheless, my point is that, compared to the Bible, Babylonian literature has a lot to say about its underworld. For a start, there is one reference to its being built by Ninurta from a particular type of stone. But there is no mention of the creation of a Hebrew underworld in Genesis or anywhere else (the features of creation absent from Genesis 1 are illuminating in themselves as regards its purpose – maybe I should do a post on that sometime). Most of the available information concerns the approaches to the underworld, including a road that leads to the underworld, a river that flows at the entrance to the underworld, and the gates that lead into the underworld. The presence of palaces, a house/temple, a courtyard, and perhaps even a temple-tower in the underworld demonstrates that the region was conceived as a great temple complex. In some traditions, this temple complex may have represented the entire underworld. However, it is more likely that the underworld was thought to be a complete underground city. Although darkness is a notable feature of Ereshkigal, the sun god does seem to visit it on his way from sunset to sunrise, which must cheer things up in a way incompatible with the idea of a perpetually gloomy underground cavern. In fact, the sun god could take a number of possible routes – a road or the banks of a river that flows by its entrance, as used by deceased humans, for example. But gods also gain access via a “Stairway of Heaven” going directly between the gates of both heaven and the underworld (try fitting that into the Victorian cosmography – an escalator built into the pillars of heaven, maybe?) and there are also cracks through to it from the earth’s surface useful for demons and ghosts to access the world of men. In short, then, there is quite a literature about a pretty definite, if not necessarily physical, Babylonian underworld. Similar things can be said of the Egyptian underworld, though matters are complicated both by the changes in Egyptian thought over time, and by their willingness to embrace contradictory concepts, such as the need for the dead to traverse the underworld to become stars under the protection of Nut, the goddess of the heavens. Once again, the idea of a realm of the dead under the earth originates phenomenologically from the practice of burial. But the outworking is very different from that of Mesopotamia – and just as unlikely to have been considered in strictly materialistic terms by the Egyptians themselves. At present, some 192 spells are known, though no single manuscript contains them all. They served a range of purposes. Some are intended to give the deceased mystical knowledge in the afterlife, or perhaps to identify them with the gods: for instance, Spell 17, is an obscure and lengthy description of the god Atum. Others are incantations to ensure the different elements of the dead person’s being were preserved and reunited, and to give the deceased control over the world around him. Still others protect the deceased from various hostile forces, or guide him through the underworld past various obstacles. Famously, two spells also deal with the judgement of the deceased in the Weighing of the Heart ritual. Now, what do we get if we don’t assume a priori that the Bible borrows its ideas from Mesopotamia, or Egypt, or both? I’ve already mentioned that we get no place for the dead being created in Genesis 1, either because human death was not considered part of the original creation (cf Genesis 2) or, more likely, because it lay outside the purpose of the text. In fact, all we get throughout the whole Old Testament are references to sheol (“the grave”) and half a dozen references, all in parallel with sheol, to abaddon (“destruction”). These references are so indistinct that the critical scholarly view has been that the Hebrews did not believe in life after death at all, placing all their hope on covenant blessings in this life. That, however, is probably an exaggeration. There is enough biblical material to suggest at least some shadowy continued existence for the dead. To what extent an actual realm (still less a physical region) is intended by sheol is arguable, though. If one does a word search using a concordance, and substitutes “grave” and “destruction” for whatever translation is used, a large proportion of these references could simply apply to the deceased lying where he or she was buried, either without any awareness or, at most, a dim consciousness. Whatever your hand finds to do, do it with all your might, for in sheol, where you are going, there is neither working nor planning nor knowledge nor wisdom. Now, is there anything in that which indicates he is thinking of an underground cavern-realm, rather than his local cemetery? If I go up to the heavens, you are there; if I make my bed in sheol, you are there. Incidentally note where David places those limits – heaven upwards (no celestial ocean), sheol downwards (no abyssal tehom), across the sea laterally (land surrounded by the world ocean). But since sheol is considered the lowest of these, apparently in a physical sense, this seems to mean more than just a metaphor for being dead. In the story of King Saul’s summoning up of Samuel’s spirit through a medium, although sheol is not mentioned, Samuel’s spirit appears rising out of the ground, though his grave was not at Endor. He asks why Saul has “disturbed” him by “bringing him up”. Ignoring any difficulties about whether this truly was Samuel, whether the medium’s powers were real, and so on, the belief appears to include the dead not being localised to their burial place, which could be accounted for by a subterranean region that could be traversed by the dead. Yet even here, the impression is that Samuel was lying in well deserved rest, rather than being busily engaged in post-mortem activities in the world of the dead. Clearly the best understanding of sheol here is either “virtual grave” or “actual grave” (if he is understood to have actually died and subsequently restored to life). But he’s not pictured as having moved to a subterranean domain from the ocean bed. Here sheol appears to contain ex-kings occupying posthumous thrones, and yet there is still a very prosaic association with maggots and worms. Furthermore, one needs to remember that the prophet addresses his words to the king of Babylon, as a taunt, in terms relevant to Babylonian beliefs – there is no guarantee that Israelites would see things the same way for themselves. Multitudes who sleep in the dust of the earth will awake; some to everlasting life, others to shame and everlasting contempt. In so doing, whatever the reality of sheol was, he marginalised its importance by setting the scene for the hope of the general resurrection which received its unexpected firstfruits in the raising of Jesus. As eschatology, resurrection became a clear, and inaugurated, reality. But even in the New Testament, the intermediate state of the dead, and its “geography”, remained fuzzy, simply because (as in Old Testament times) it was not a central concern, so had not been clearly revealed. The only biblical references to anything that might remotely be deemed physical features of sheol are those few referring to the “gates of sheol“, such as Job 17.16; Ps 9.13; Ps 107.18 and Isa 38.10. All these are poetic, and all occur in the context of individuals coming near to death and being restored, in the nick of time as it were, by the Lord. In such a context what better metaphor, or euphemism, for “death” could there be than “gates of the grave”, especially given the Jewish practice of burial in caves which would make the metaphor close to literal? In fact, the NIV consistently translates the phrase “gates of death” to indicate this. So this appears quite different from the gates in Babylonian or Egyptian literature, which are associated with roads, rivers or stairways and, as described above, numerous other architectural and topological features. In short, though there is certainly some use of the concept of an underground dwelling of the unseen dead in the Bible, there is very little to match the clear place such a thing has as a cosmographic region in Babylonian and, more arguably, Egyptian thought. In fact, the Hebrew Scriptures are almost unbelievably reticent in their use of the concept, barely distinguishing it (even in their terminology) from the basic truth that one buries dead people in a grave (sheol) and that they don’t do much there except suffer the destruction of their bodies (abaddon). 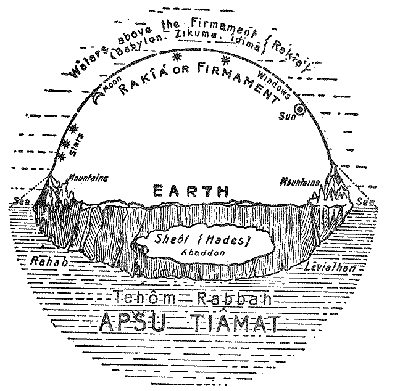 The claim, then, that the Hebrew’s saw the cosmos as three-layered (heavens, earth and underworld) is an extrapolation as far beyond the evidence as the idea of a celestial ocean or a bottomless abyss. The Hebrew “cosmology” is remarkably conservative, speaking much about the seen, and very little about the unseen. In fact, the Bible shows less influence from outside cultures than even some strands of Christianity, as demonstrated by the mediaeval Lyke Wake Dirge, which as set by Benjamin Britten here is musically sublime, but theologically execrable.